Getting "lucky" in Las Vegas. 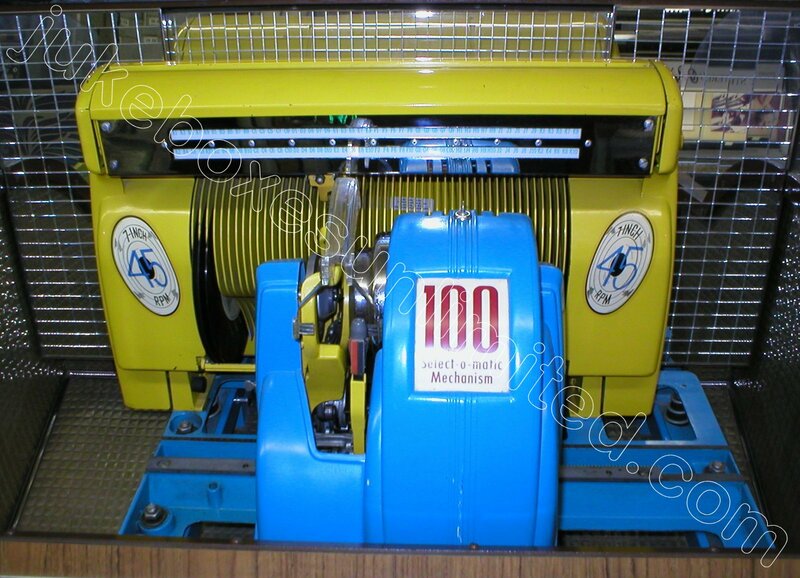 By 1949, Seeburg had been instrumental in getting RCA to create 45 rpm records. 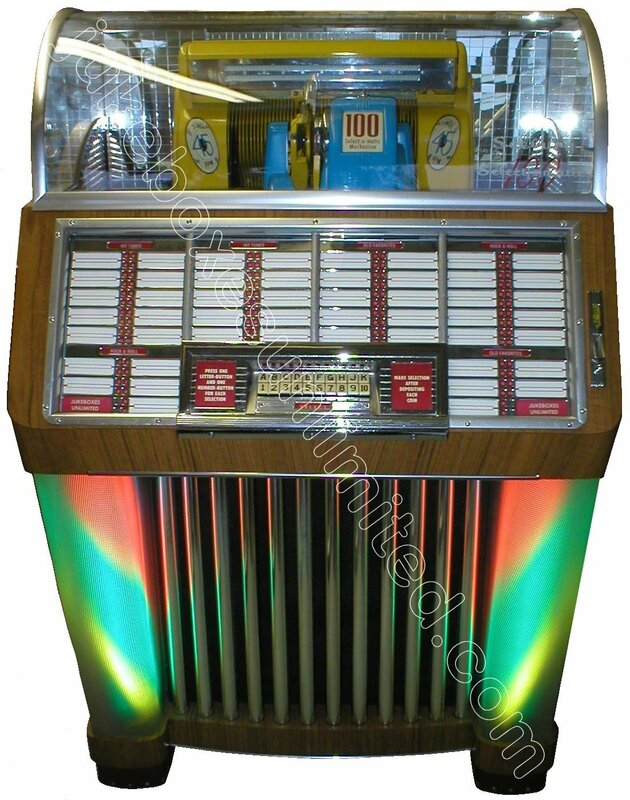 Seeburg wanted to reduce the size of jukeboxes, to fit in small establishments like diners, while offering more selections than the bulkier 78 - rpm units. 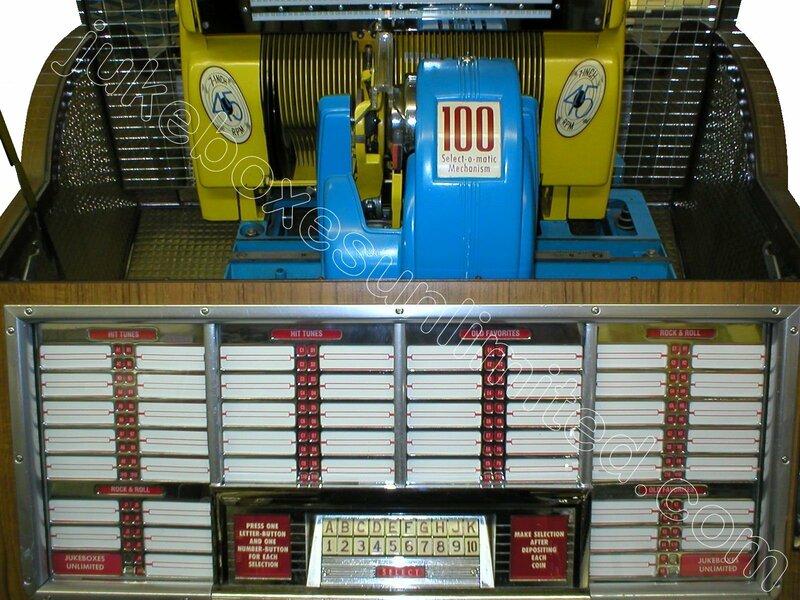 Of course when the first 45 rpm jukebox was introduced in October of 1950 it was a Seeburg. This was the model "B" and it’s successor in 1952, the “BL”. The model M100 "C" was introduced in May of 1952 for the 1953 year. It was a "B", glorified with frosty white pilasters and revolving color wheels, but it took the world by storm. It turned out to be Seeburgs’ biggest seller. 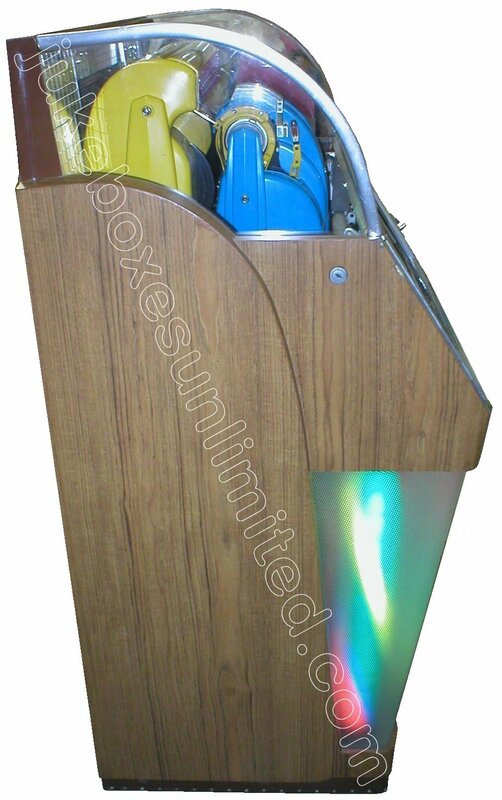 This wonderful jukebox has been entertaining friends and family in the home of Don Muller, owner of JUKEBOXES UNLIMITED ®, since his shop rebuilt it back around 1980. Many a party was held with this beauty as the main attraction cranking out good old Rock and Roll. Freshly reconditioned, it's ready to start a new life entertaining new friends. Maybe even you and your friends? The original cartridge has been updated with the later version Thorpe for great sound through the original 15-inch speaker. 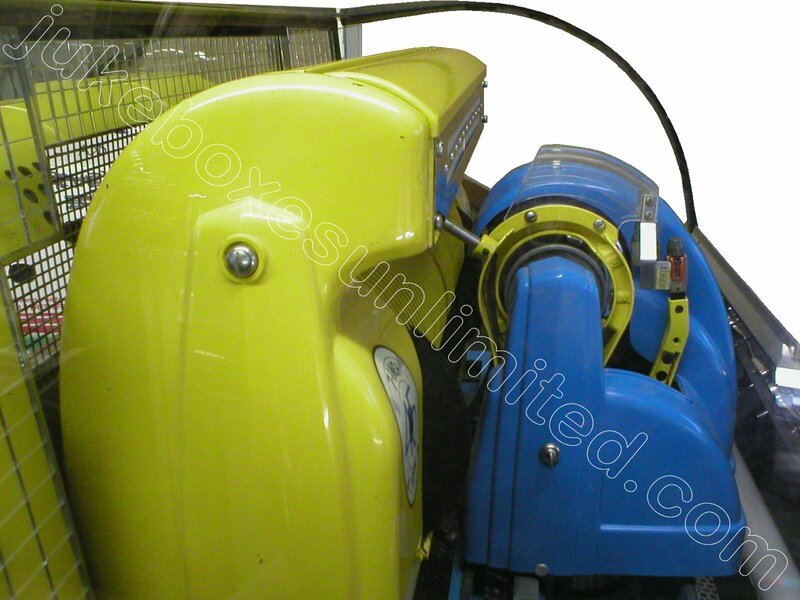 A newer model mechanism motor runs smoothly under the original mechanism cover. 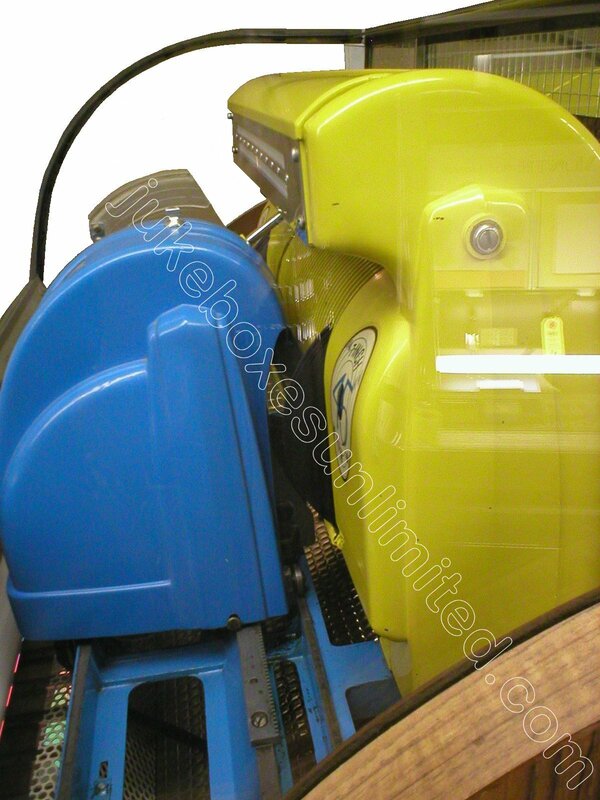 A rugged new motor runs the chain to drive the color wheel assemblies. New mirrors installed behind the mechanism. All coin equipment (including cash bag) in and working with a "free play" button installed to avoid burning up the latch bar solenoid. Standing sentry in front of the speaker are the 100% original thick round mirror grill tubes, not the thin ones they make today or the metal plumbing pipes. Covering the speaker is real speaker cloth not some pretty fabric from a linen store. Speaker cloth doesn't restrict the sound the way fabric does. 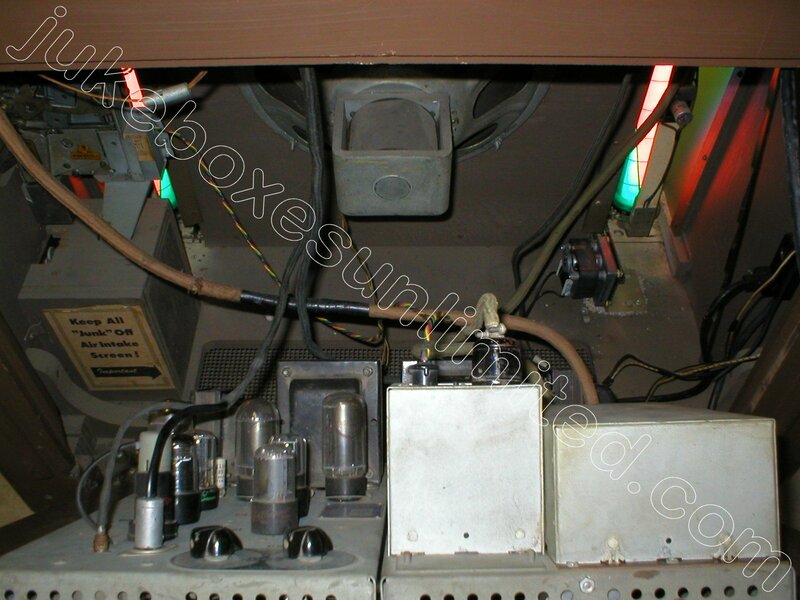 As big as JUKEBOXES UNLIMITED ® already was at the time this machine was rebuilt, nearly all reproduction parts were either made "in house" or exclusively for the company. One prominent item was the pilasters protecting the color wheels. And protecting is exactly what these pilasters do. 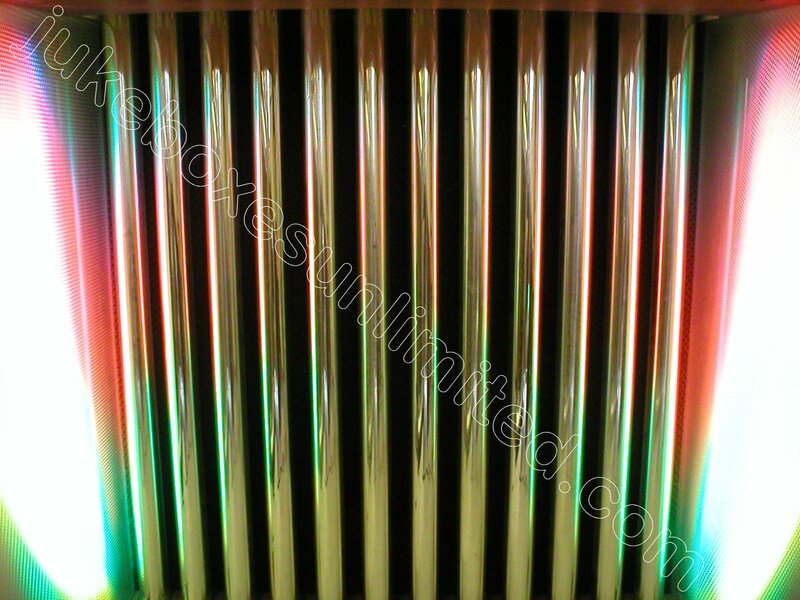 They were hand made on a custom built wooden form using several heating strips to bend the General Electric Herculite plastic. You couldn't even kick these babies in. Never fear of children damaging the front of this gem. Through the years we've seen all sorts of refurbishing jobs that time has taken a toll on. 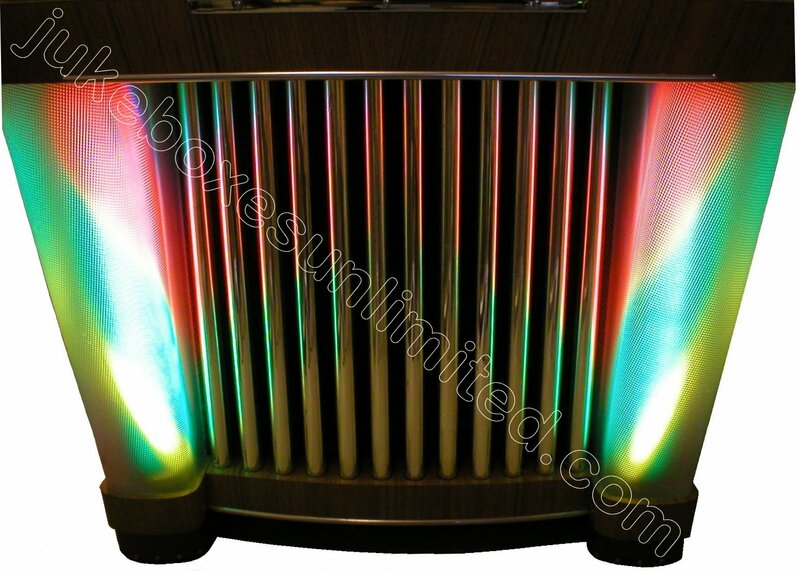 "C" pilasters were one thing but also on Seeburg "B" and "C" models the methods of covering the original wood cabinet went from contact paper and vinyl sheets that would shrink or loose glue to veneer that would get all nicked up. 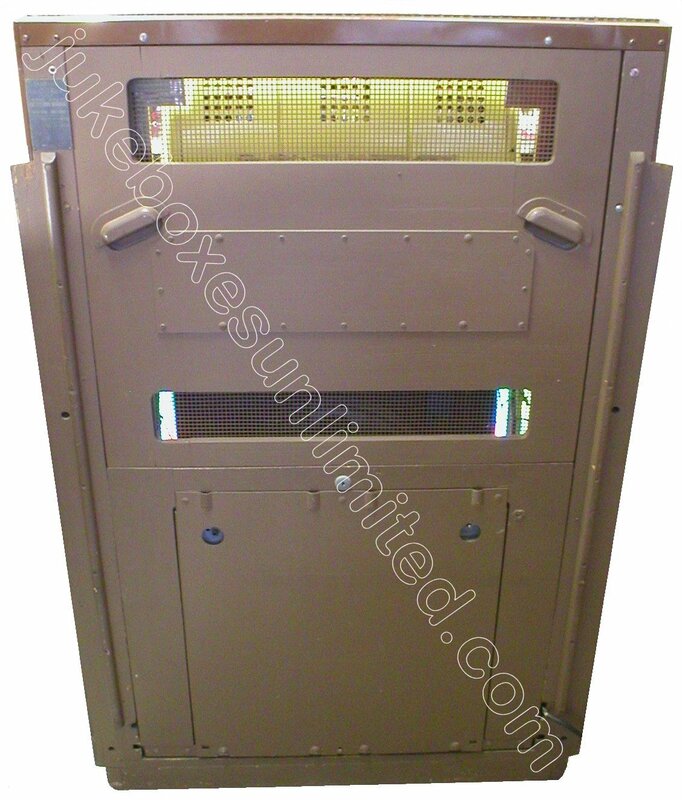 Between 1978 and 1985, the craftsmen at JUKEBOXES UNLIMITED ® applied Formica brand laminate on many of the cabinets they did. 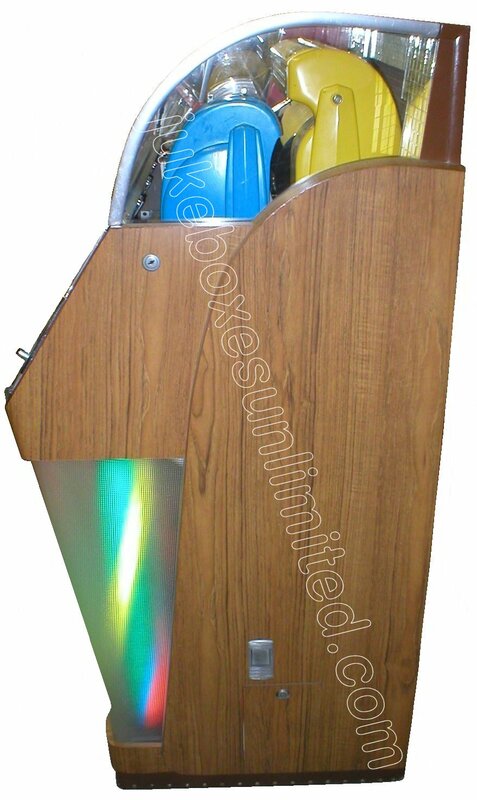 Even three decades later these jukeboxes look exactly like they did the day they were sold. Formica can really take a beating. In fact this is one of those Formica cabinets that actually did take a beating during the infamous 1994 Northridge earthquake in California’s beautiful San Fernando Valley. (See close up of said nick.) 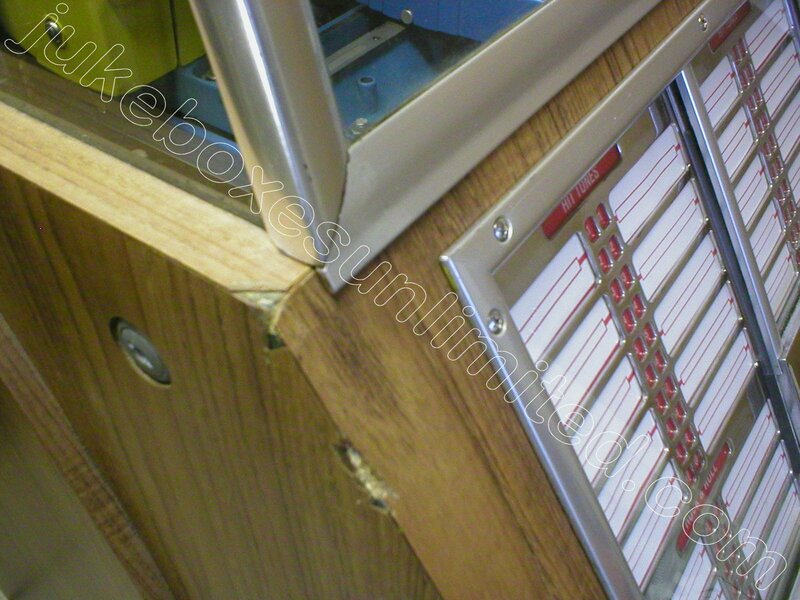 Aside from this flaw, this is one beautiful, good working, great sounding jukebox. Once again, let's picture it in your entertainment area. Maybe even with a small dance floor in front of it? Where do you want to hang the disco ball? And chaser lights around the dance floor? Can't forget them! Oh, and then you'll want a strobe light somewhere.